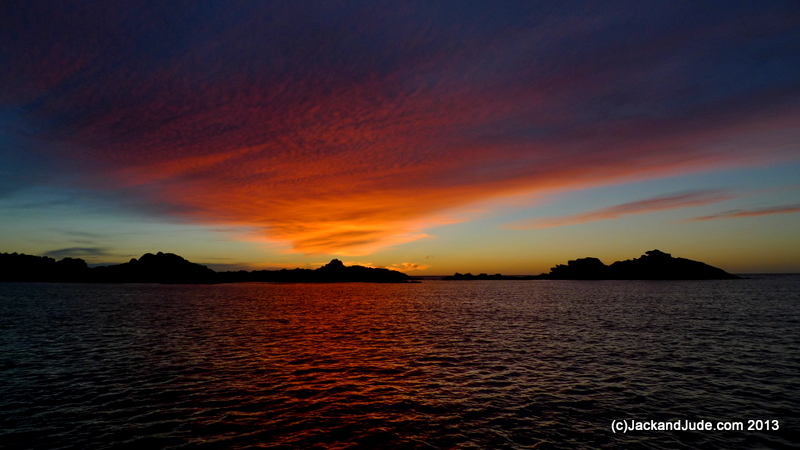 First we voyaged across the southern ocean arriving in Albany at daybreak on Christmas. 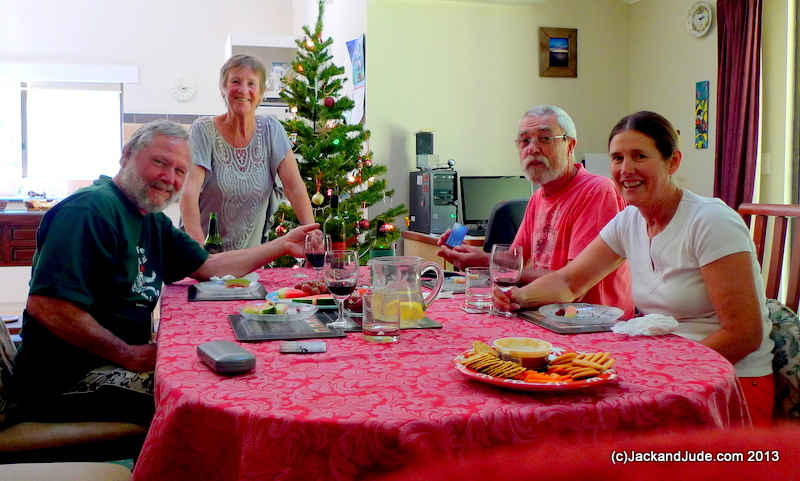 Then Dr Ian whisked us away for Xmas desert and to greet lovely wife Pat. We also met the bride to be and yet to be husband. 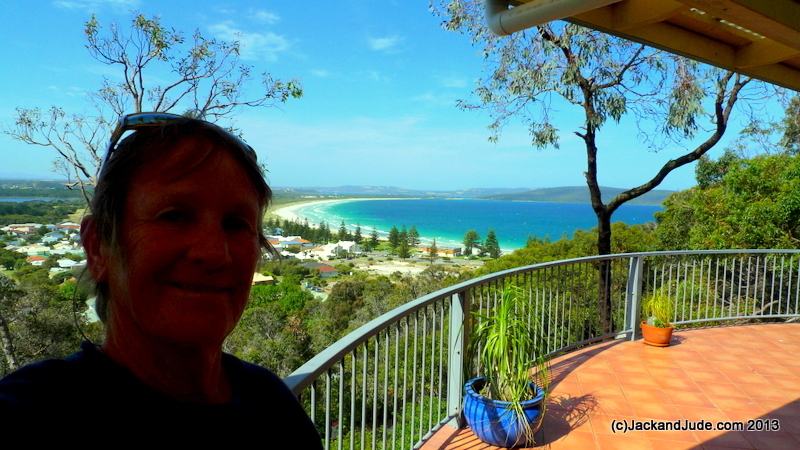 Great views over Middleton Beach and King George Sound. 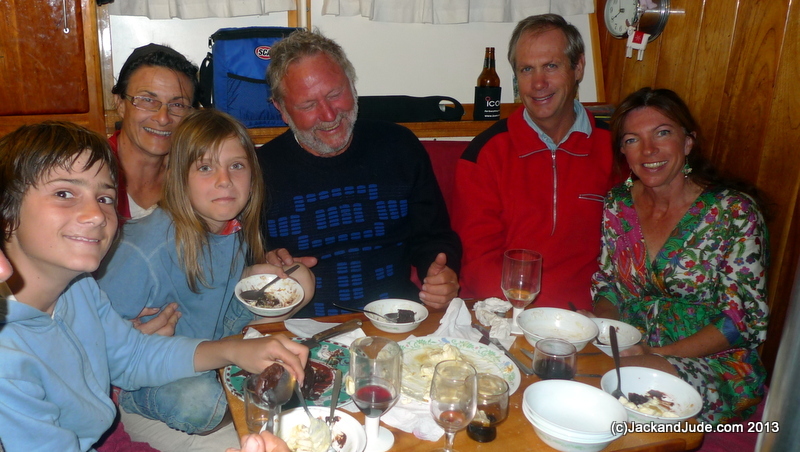 Then we return to Banyandah for our own dinner party with a few yachie friends; Rob and Lou from Zeehaen, and those from Flinders Chase who had just made a 56 day passage from Southern Africa ! 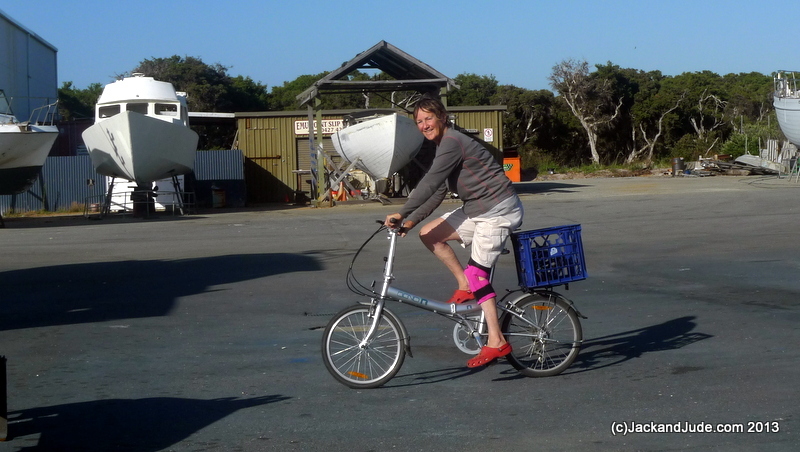 Superb Christmas Gift – seeing my lady ride a bike once again. Better than unwrapping gifts, Earth bestowed a present far greater than anything made by man. The gateway to Albany was marked by soft golden reflections upon the steel grey sea surrounding Eclipse Island. And once again in the Southern Ocean, massive, mighty swells tossed white spume high over smoothly worn granite rock. 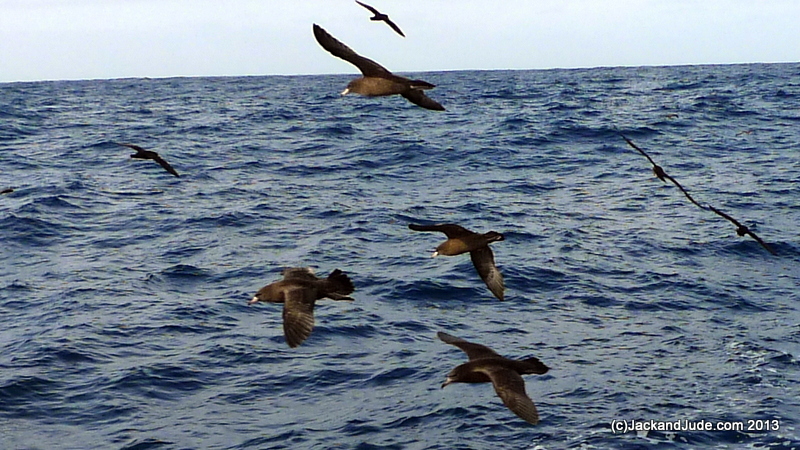 Meanwhile overhead, Brown Shearwaters wheeled close just as our fishing line gave a twang. Suddenly Jack finds himself in a battle as our Christmas dinner resists with all its might, fighting for life until alongside when Earth’s bounty comes aboard wiggling, and is swiftly dealt with. Then overhead, the flock of Earth’s wild creatures sense a feed and swoop to look for their own Christmas handout. So we shout, “Goodwill to all men and beasts,” and feed them, tossing morsels high into the air to observe our fellow creatures squabble and tussle for every last bit. Christmas day or any other, there’s no greater pleasure than to be alone with your sweetheart and totally surrounded by Nature. Our very best wishes for a healthy happy new year. 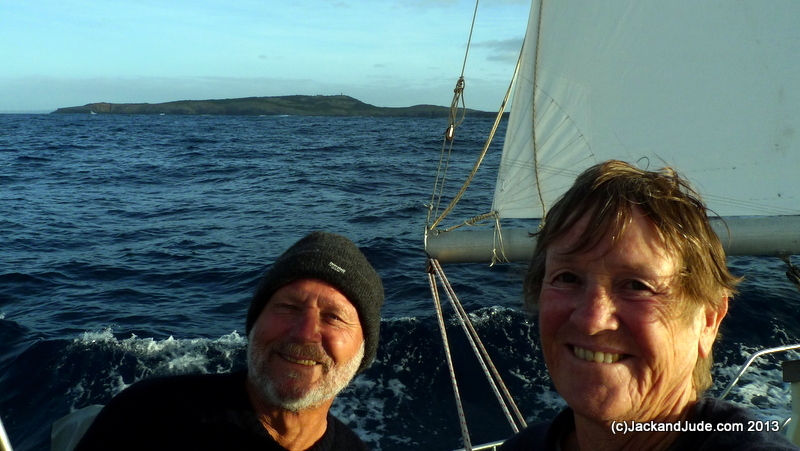 Dave and Sue enjoyed their day aboard Banyandah – Saying they learned heaps about managing a sailing ship. Must admit they’re an easy couple to talk with, we didn’t stop gabbing till the final, rather sad so long at Busselton Beach. We spent one night at Quindalup in what must be described as sloppy conditions, thinking we might as well be at sea. 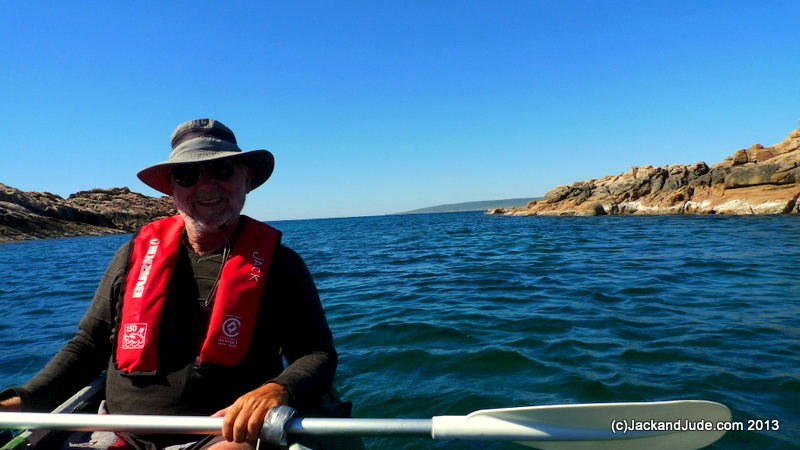 And so we left early the next morning for a super fine, slow saunter around Cape Naturalist and straight into Canal Rocks, a tiny bay on the west side leading to Cape Leeuwin, using the engine only to anchor. Must have been 40 tinnies out fishing, churning up our anchorage when they came back in. But then we had the beautiful spot all to ourselves. 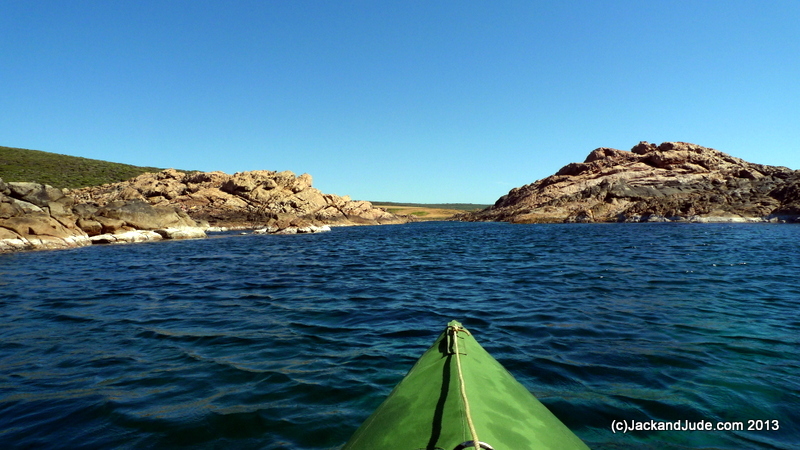 We launched the Green Machine one last time before packing it up, and toured the wonderful rocks, discovering why the place is named Canal Rocks. 4AM start meant we were in bed by 8….. 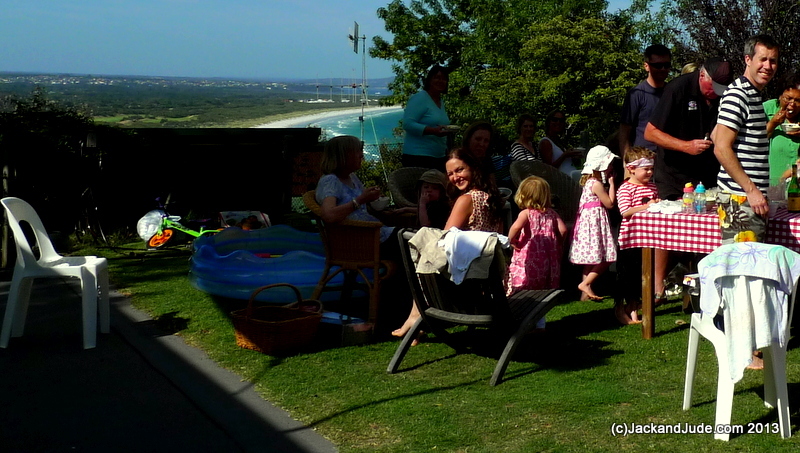 In the southern half of Western Australia we have met many interesting people who have been very kind to us. Maybe Jude’s hobbling has garnered their sympathy, or maybe it’s their admiration as they wonder how a lady with a busted leg in her mature years can be so happy sailing a ship. 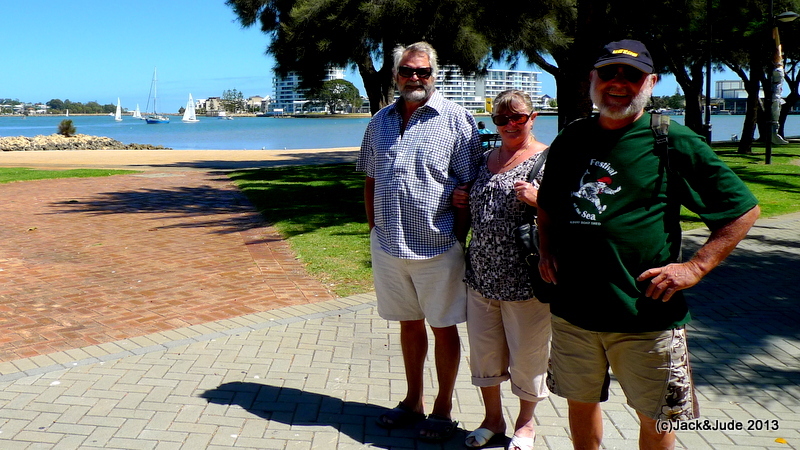 Our good times continued here in Bunbury, where our run of luck got a boost when again we met Dave and Sue, the ex-postmasters of the Macquarie Harbour Post Office in Strahan Tasmania. 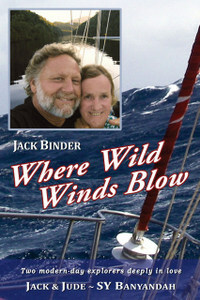 We first met them a few years back when posting our books and DVDs, and they bought our two best sellers. 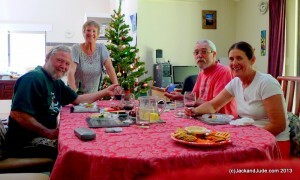 A fine Sunday lunch at their new property just outside Bunbury near the Leschenault Estuary lead to a drive around the countryside today and will be followed tomorrow by our sailing together down the coast to Busselton. The first recorded sighting of Bunbury was by French explorer Captain Louis de Freycinet from his ship the Casuarina in 1803. 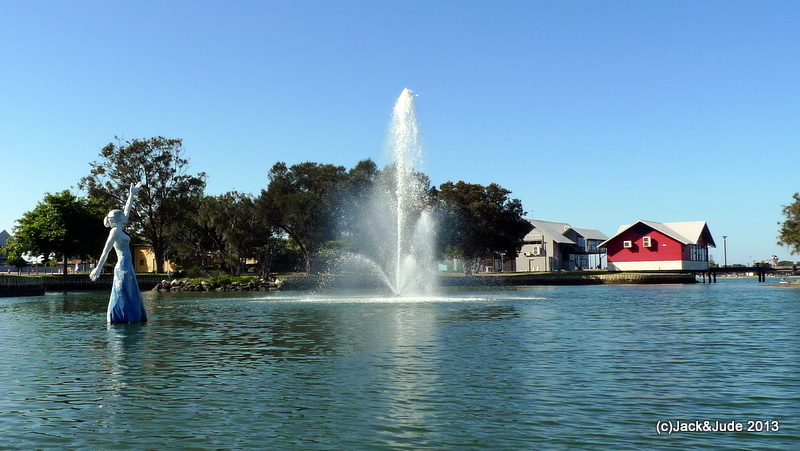 He named the area Port Leschenault after the expedition’s botanist, Leschenault de la Tour. The bay he named Geographe after another ship in the fleet. 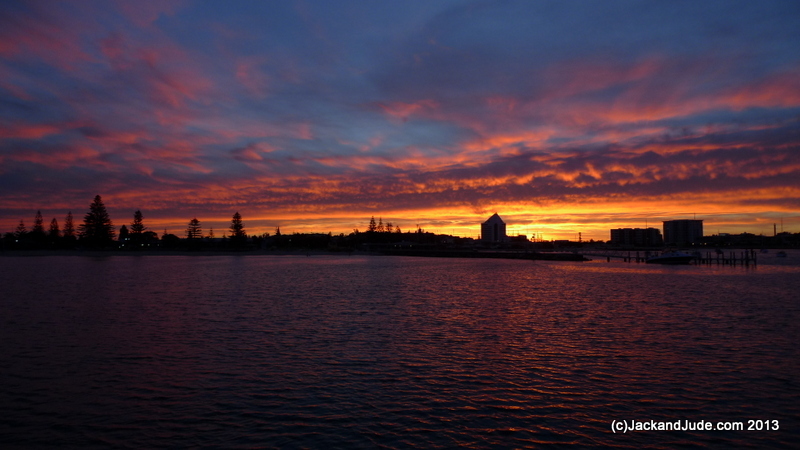 Established in 1836, the port city of Bunbury is the third largest in Western Australia after the state capital, Perth, and Mandurah. 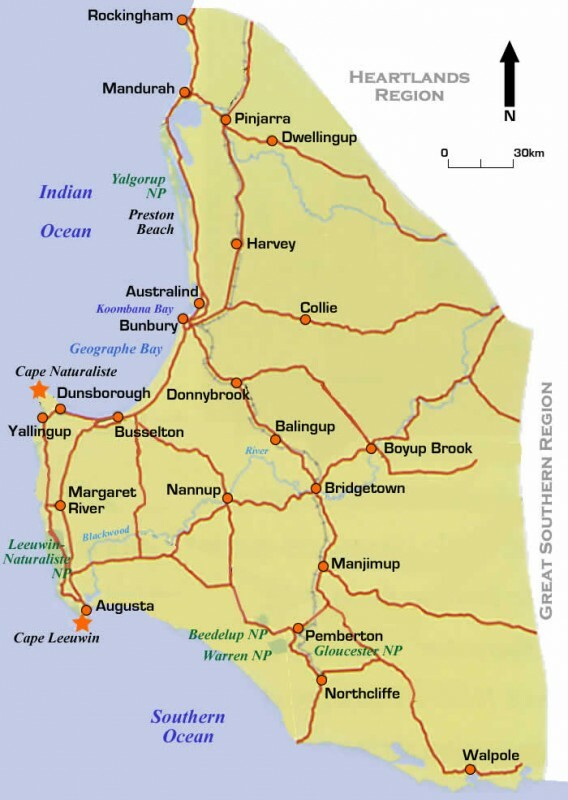 It is situated 175 kilometres (109 mi) south of Perth, with the port servicing the farming, mining, and timber industries of the south west originally connected via an extensive rail network. 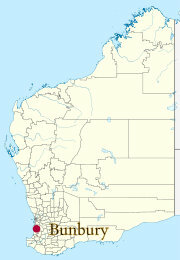 In 2007 Bunbury was recognized as Australia’s fastest growing city with a population of 32,499. We have enjoyed Bunbury. 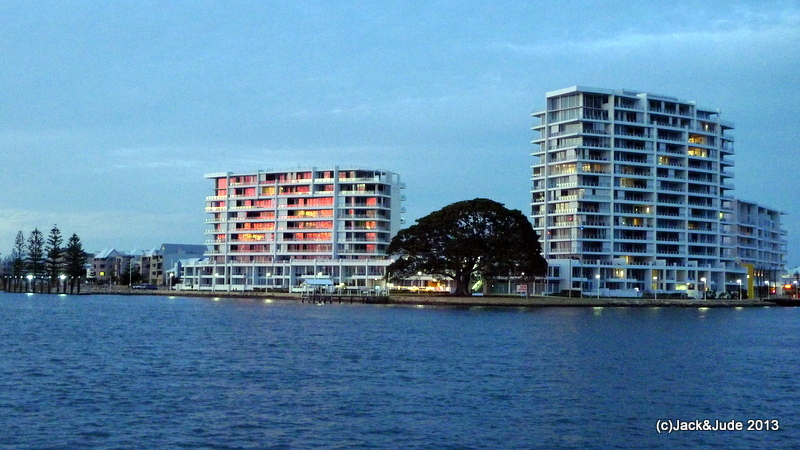 It has such a nice aspect of a wide bay that host yacht races every Wednesday twilight and Saturdays. Pretty much everyday, aboard our Green Machine, Jack and Jude have explored this vast span of water. Each morning before mid-day we have taken off for a keep fit paddle that often ended right downtown, where after changing into city garb we sauntered off for a luncheon and a bit of shopping before again changing garb to paddle home. 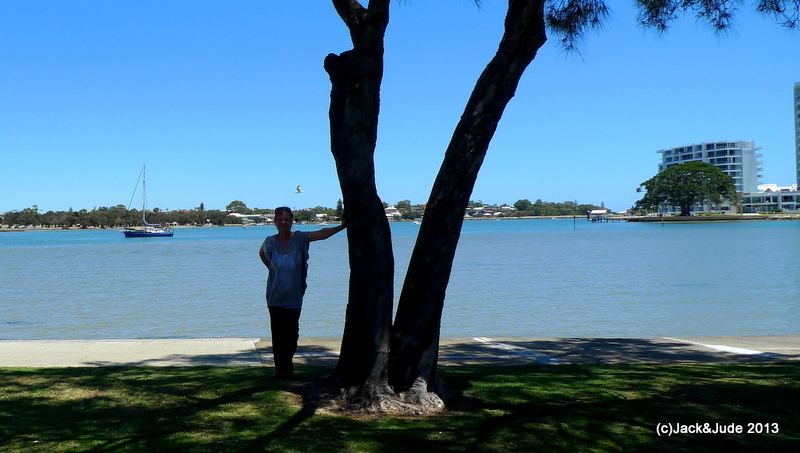 A favourite routine of ours was to stop at the Koombana Bay Yacht Club beach for a swim and freshwater rinse before heading home to do a bit of editing or whatever. One of our paddles took us to the Dolphin Discovery Centre, a non-profit organ­i­sa­tion com­mit­ted to dol­phin research, edu­ca­tion, and tourism, where their was quite a crowd in waist deep water, and weren’t we delighted to witness a family of Bottlenose Dolphins swimming up and down their collective legs, close enough to touch. 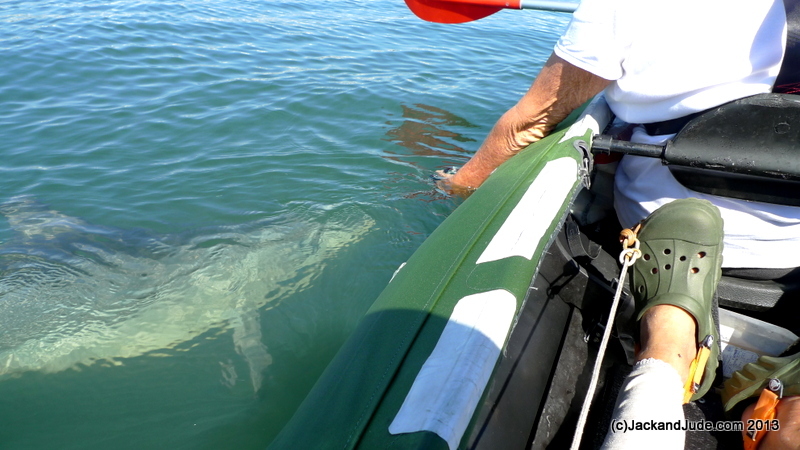 Later, a bit further on in a quiet nook, we had a pod of about ten Bottlenose take a fancy to us, swimming right up to our Green Machine. 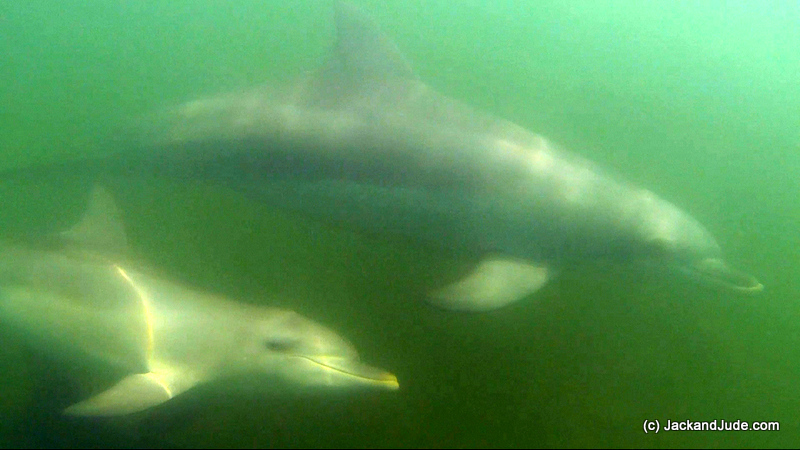 They were fascinated by our GoPro camera and came within inches of it. The closest encounter we’ve ever had. 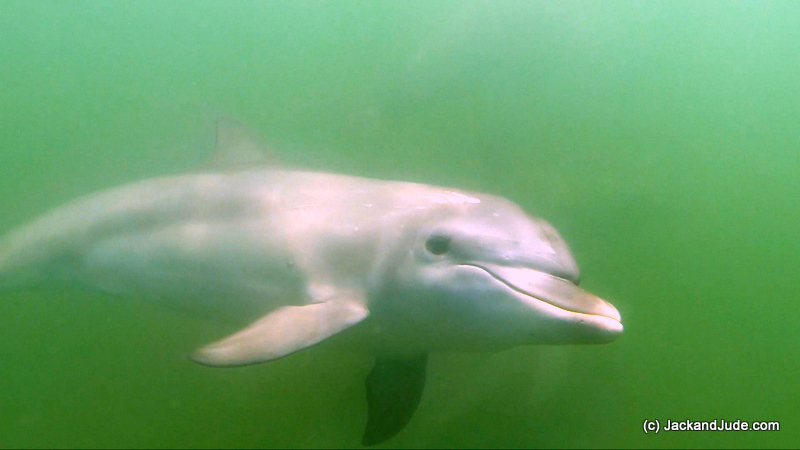 The footage recorded their rapid-fire clicks as they swam in for a closer look. Cruising is a lot about Nature, and the freedom to go and do what we like. 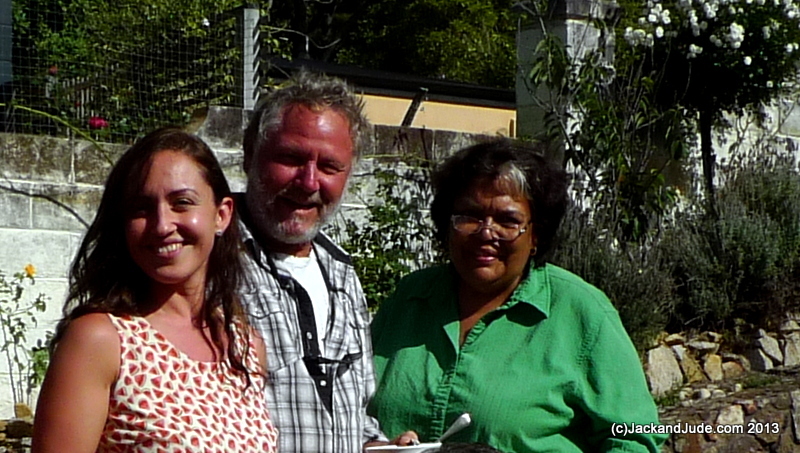 But it’s also about meeting interesting, friendly folk and sharing experiences and ideas. It’s a wonderful life. At this festive time let there be Peace on Earth. Please think of the other creatures when giving thanks this Christmas. Sadly, we have heard discussions on the radio of other religions at Christmas, how some wished the Muslim stores would decorate their shops, and the ridiculous war-cry of Ban the Burqa has again raised its ugly, intolerant head. The most settled time we can remember is the 80s when mankind seem to find tolerance for all religious beliefs. It was a time when we moved forward in Peace. 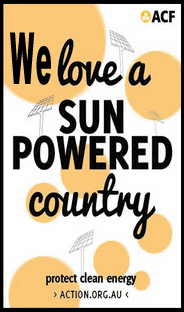 Abbot Point coal port approval signals the Coalition government’s industrialization of one of the most beautiful and fragile ecosystems on Earth. A combination of four terminals will ship an additional 190 million tonnes of coal every year for decades to come. It means continuously loading coal onto 1500 ships inside the Great Barrier Reef every year. 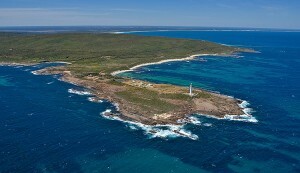 Environment Minister Greg Hunt has given the project approval to dump 3 million tonnes of dredging waste in the ocean. Research scientist, Jon Brodie, at James Cook University says mining activities presented a greater threat to the reef than agriculture. “Albany by Christmas,” that’s the cry on board the good ship Banyandah at the moment. Many good friends await our arrival there. Only two things stand in our way. 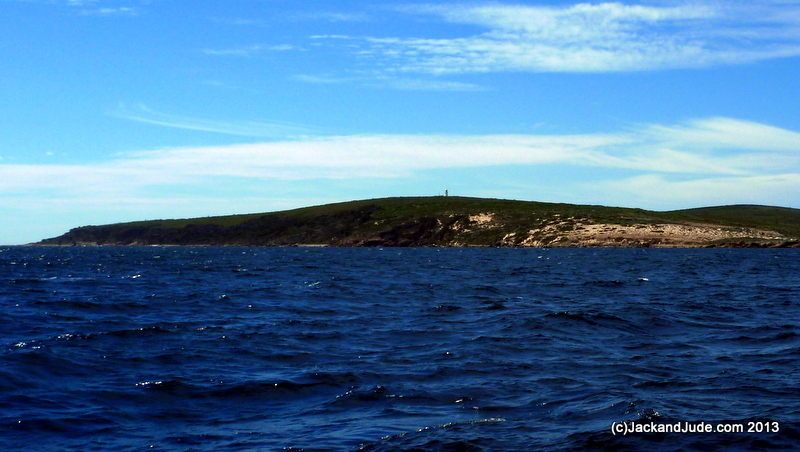 Cape Leeuwin, the third nastiest cape in the world, and the weather – not that it’s bad. Just the opposite in fact, it’s too darn good. Nothing but HIGH pressure cells over us for as far as the forecasters can see and they bring light southerlies and easterly breezes, both very unhelpful for the three hundred mile voyage from Dunsbourough/Geographe Bay around Cape Leeuwin and then on to Albany. There are no suitable stopping places in between. Fremantle is just off this map to the north, and Albany just off to its lower right. Departing the Fremantle Sailing Club at first light, Jack and Jude once again enjoyed the serenity of the open sea after what had been a hectic week alongside the club’s collector dock. For two so accustomed to just their own company, greeting so many visitors was both super pleasurable, and tiring. But that morning, hearing only the wind in our sails and the sea slipping past our ship brought relaxation we hadn’t known for what seemed weeks. Familiar sounds like the morning train’s horn, the early traffic rush, and construction noise at the clubhouse were soon forgotten in the need to navigate our ship through the rocks and shallows leading out of Cockburn Sound on a brisk, fresh off the land wind. By noon that day, the tall high rises of Mandurah were changing our vista once again, and then we entered the inlet to anchor off what has become a very busy city. In the town park a circus for the kiddies was loudly underway and across the narrow inlet, a water park was alive with screaming young ones. We didn’t mind. 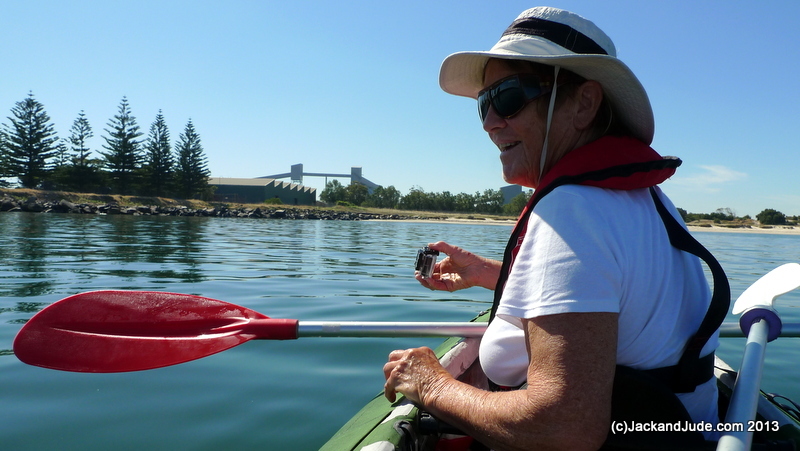 Anchored off the city of Mandurah, which is an hour’s drive south of Perth, beautiful canal developments with scrumptious luxury houses provided a perfect place to Kayak early morn. We hooked up with Mick and Norma first met in Shark Bay on board their 53′ Cumulus for a enjoyable cappuccino along the water’s edge, then carried onto their house for a good Aussie BBQ. The winds down this way are much effected by the hot sun, creating strong south winds during daylight hours called the Fremantle Doctor, followed at night as the land cools by equally strong offshore winds. 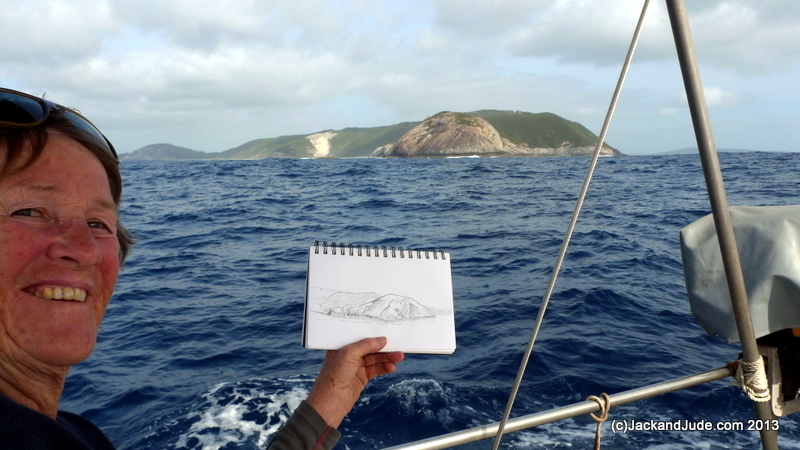 To reach out next destination we needed to avoid those strong south headwinds and so that dictated a night sail. 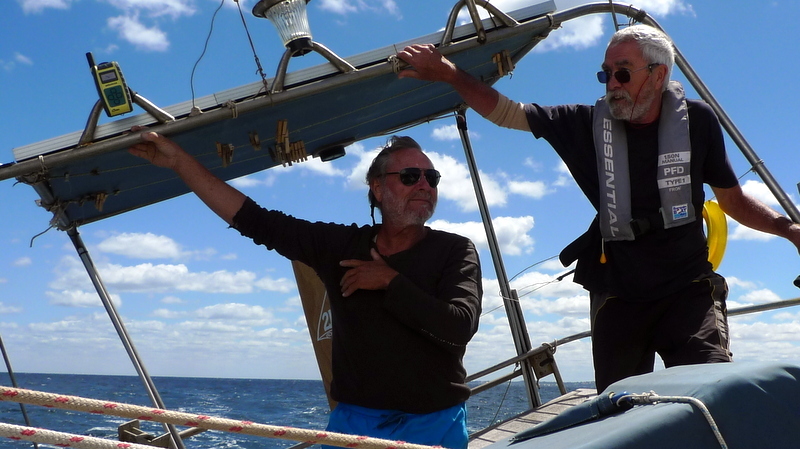 Leaving at the very beginning of the 11th day of the 12th month of the 13th year, only a reefed mainsail was needed to barrel us along touching 6 and 7 knots, a very comfortable speed for Banyandah. Under a clear star filled night the shore lights soon disappeared leaving us afloat in a black universe that was heavenly. Dawn saw the stronger winds slip away over the far horizon, and as the sea calmed, Banyandah seemed to glide towards her next destination on slippery silicon rails. 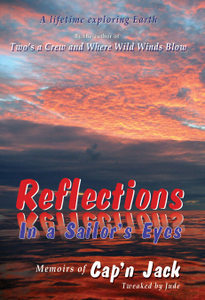 The night had tired us with the little sleep we’d gotten before setting sail and as Jack lay in his motionless bed listening to the soft gurgling of water alongside his ship, a more perfect experience cannot be imagined. 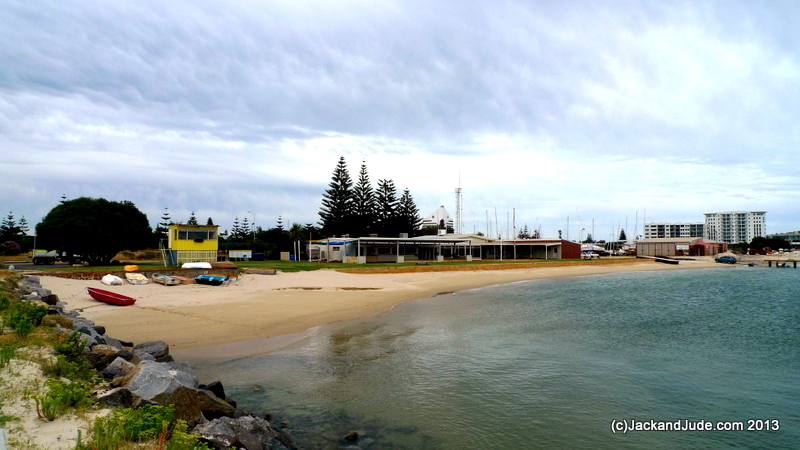 We sailed Banyandah right past the headland into Koombana Bay with the small city of Bunbury adorning its sandy shores. 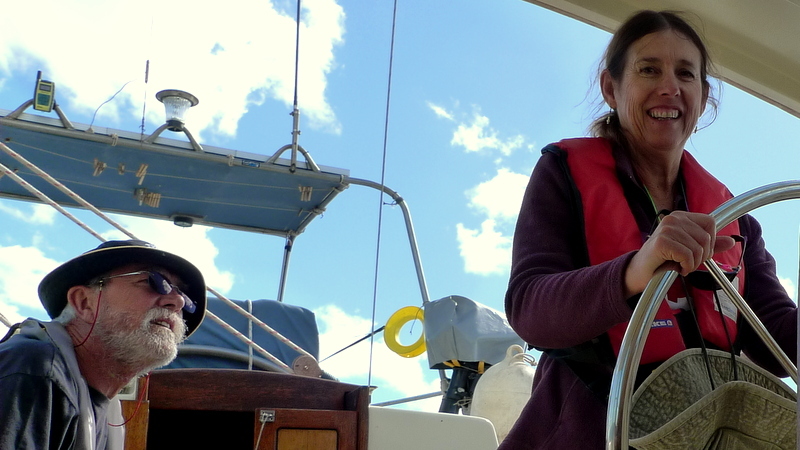 From departing to anchoring, 55 nautical miles using the sum total of 10 minutes of engine to set our BOSS anchor. The festive season is in full swing here as it probably is all over the western world. But just for a moment, imagine all the non Christians. The Jews, The Buddhists,The Muslims. They far out number those celebrating Christmas, and some would find it as unsavory as the Australian Aboriginals find celebrating Captain Cook’s landing, a favorite holiday downunder. Jack and Jude do not celebrate Christmas anymore. 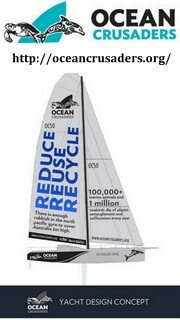 Not only is it the best time to sail upon southern oceans, we find the goodwill to all mankind it represents just does not find itself above the huge marketing to buy gifts, gifts and more gifts, many just plastic junk robbing Earth of her future. When we had our workshop, we fashioned something personal from timber scraps. Now we limit our gifts to reading books and other useful things for our grandchildren. Please have a read of the Twelve Do’s for Christmas. 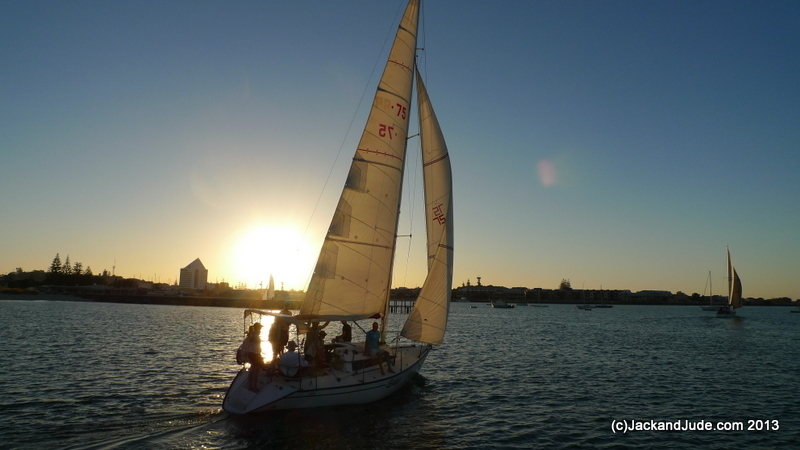 We sailed from Mandurah after their festive fireworks and anchored at Bunbury in time to watch their Twilight Race under sail. And what a fine evening display. 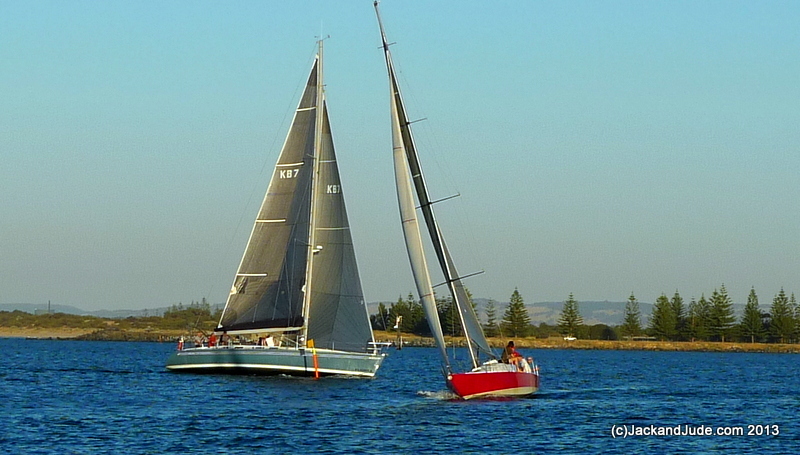 Up to thirty vessels of every size took sail on the picturesque waters of Koombana Bay. Many of them did a sail by to welcome us, so Jude took the opportunity to capture several splendid photographs of the fun. 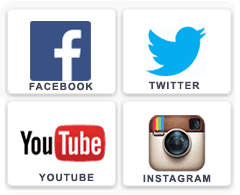 We’ve created a photo album of the best for you to enjoy. 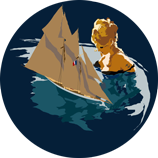 Any owners of boats photographed wanting the full size image, just send us an email. On board one of those vessels were Dave and Sue, last seen in far away Strahan, Tasmania, where they operated the local Post Office. They had said they’d be moving to warmer climes, and they did. It’s a small world. 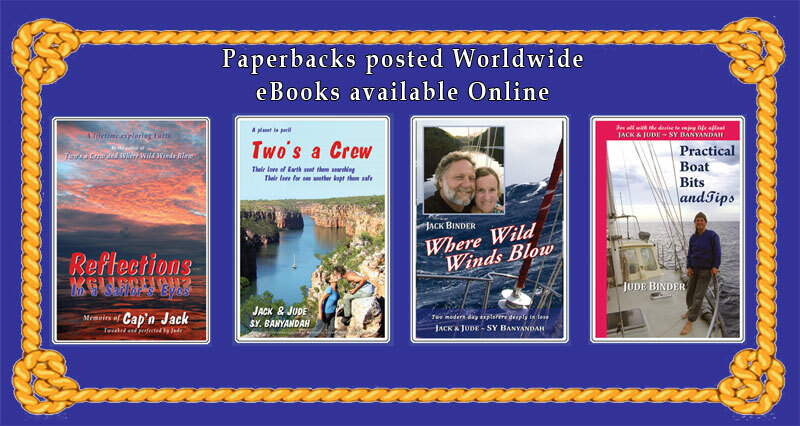 This arrived in the morning mail from Di and Harley in New Plymouth NZ – What a small world it is – especially in the sailing community. We had Margaret and Sue visit us yesterday and they told a story about visiting the Kimberley and going onto a yacht very much like ours to see if a lady’s leg was broken. 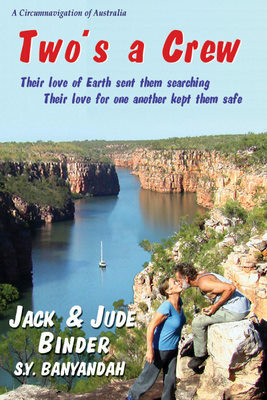 Margaret and my husband Harley were looking over “Return” when Margaret said it was so much like Banyandah! Harley then exclaimed that we knew you – way back in the 70s when our children were all small and you called in to New Plymouth NZ, and came out to Waitara (our house) for tea and to look over “Return” as we were still building her. Jude, you told me to turn the stove around and I always think of you when cooking in bad weather as it was such a sensible suggestion. I think one of the boys fell off Ellie’s bike and got concussed and we ended up in the emergency dept at the hospital???? So long ago!!! Lovely to see you are still sailing and what an amazing web site. We will download a book or two. Lots of love, Di and Harley from New Plymouth NZ.